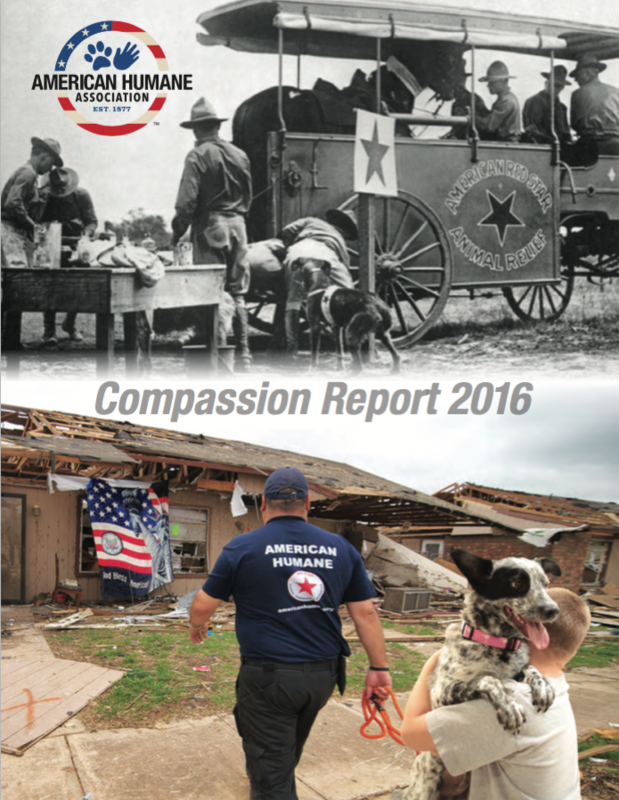 As a supporter of American Humane, you are a key part of the history of an institution that has been at the forefront of the global compassion movement for children and animals for nearly 140 years. This year, your generous support has enabled us to achieve a remarkable number of victories in building a better world for all of us. Our Red Star® Rescue team saved animals nationwide in daring rescue missions from South Carolina to Spokane, including a massive transcontinental transport campaign that rescued hundreds of animals from almost certain death and gave them forever homes. Secured major victories for millions of farm animals by partnering with giant food chains and food services including Taco Bell, Unilever, Einstein Bros Bagels, Peet’s Coffee and Caribou Coffee to improve animal welfare practices throughout their extensive supply chains. Protected some 100,000 animals working in entertainment during our legendary “No Animals Were Harmed®” program’s 75th anniversary year. Helped America’s brave veterans and military hero dogs as Congress passed and President Obama signed into law the 2016 National Defense Authorization Act containing language advocated by American Humane guaranteeing a retirement on U.S. soil for ALL military working dogs and giving their former handlers first rights of adoption. Our Kindness 100™ campaign reached 15 million schoolchildren with a new K-6th grade curriculum teaching them the value of treating animals humanely. The massive nationwide effort commemorated the centennial of our “Be Kind to Animals Week®,” the largest humane education effort in history. We celebrated the launch of a powerful new voice for children and animals – the new, bipartisan “Congressional Humane Bond Caucus” – and hosted three Capitol Hill briefings in 2015. Celebrated our fifth American Humane Hero Dog Awards®, presented by the Lois Pope LIFE Foundation, naming Harley, a puppy mill survivor, as America’s top hero dog for his work in saving other victims like him and educating Americans about the horrific abuses in those facilities. Provided lifesaving grants for service dogs to veterans suffering the invisible wounds of war through our Wags4PatriotsTM program. Continued lifesaving and life-affirming research in our Canines and Childhood Cancer study, unleashing the power of therapy dogs to help children with cancer and their families. Reached billions of people in more than 100 countries worldwide with critical humane education information through major news stories carried by the AP, The Washington Post, The TODAY Show, CNBC, ABC News, and thousands of other media outlets. In the following pages you will read about these and many more victories for children and animals, as well as our ambitious plans for the year ahead during which we will celebrate two major anniversaries: 100 years of our Red Star® Rescue team rescuing and caring for animals and 100 years of working with the nation’s military, veterans, their families, and military hero animals. They will help not only to raise awareness for the ongoing challenges, but will provide us with new opportunities to provide comfort, caring and hope to more children, animals, and veterans on both ends of the leash who need our lifesaving and life-affirming programs and services. Please consider helping us and joining our cause as we continue to build more humane communities in this country and around the world, unleash the healing power of the human-animal bond, and teach a new generation the importance of what it means to be humane.